Every holiday has its traditions. Why not start the New Year with your own? So get ready to fasten your seatbelt for this ultimate New Year's party list. Every holiday has its traditions. Why not start the New Year with your own? So get ready to fasten your seatbelt for this ultimate New Year's party list. New Year's is fast approaching so contact your UNIGLOBE Travel Consultant today for the hottest last minute deals! Banderas Bay is the place to be. Just as the clock strikes midnight, spectacular fireworks burst into the sky along this popular hotel strip. Each resort prepares a memorable medley of Technicolor, all vying for the best displays. It's a symphony of fire in the sky. I also like how the pubs are packed along the Malecon in Puerto Vallarta. Cancun's all about the ultimate sun vacation and makes a great stress-free getaway. With so many direct flights, you can opt to travel with family and friends and be on the beach with your favourite umbrella drink. Be prepared to be mesmerized by the ample New Year's Eve celebrations too. They don't call it the Entertainment Capital of the World for nothing. Just when you thought the celebrations can't get any bigger in Vegas, they get bigger. 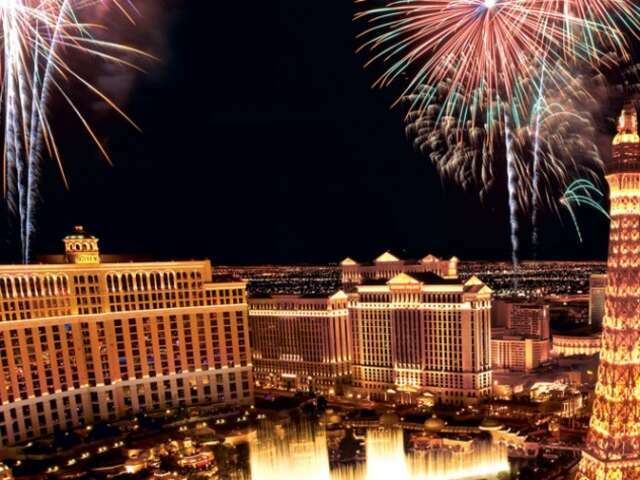 The Las Vegas Strip packs in the revellers, and fireworks light up the Nevada sky. Meanwhile A-listers attract their own following as they perform their greatest hits on stages across the city. Head to Times Square where traditionalists converge. Others find party madness across the boroughs or go all Woody Allen-ish and sit beside their paramour by the Queensboro Bridge with a glass of bubbly.